221 High Street, Glasgow. G1 1PP.Tel: 01415520940. This is the oldest pub in Glasgow. To read the full history of this historic bar click here. The bride is pictured arriving at Netherlee Church, Glasgow, on the arm of father, Mr. O. G. Prosser. 1974. 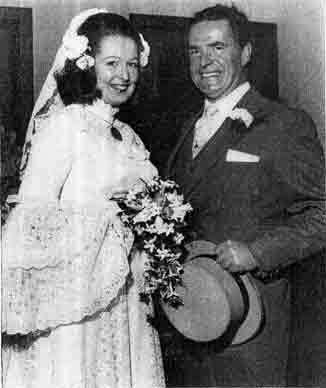 Miss Louise E. Prosser, daughter of Mr. and Mrs. O. G. Prosser, who are well known in Glasgow licensed trade circles, was married recently to Mr. Colin Kerr, Bishop's Stortford, Herts. Mr. Prosser is a director of the Glasgow and District Licensed Trade Association and vice-president of the Royalty Burns Club. Mrs. Prosser is immediate past president of the Glasgow and West of Scotland Women's Auxiliary Group. The groom is the eldest son of Mr. Archibald Kerr, formerly a licensed grocer in Girvan, Ayrshire, and Mrs. Kerr. The news that the oldest pub in Glasgow is to be demolished. Owner Colin Beattie, say's he will rebuild another Old College Bar on the site of the old one. Apart from being the oldest pub in Glasgow there is nothing of historic interest in the pub. The pub is to be demolished despite the building is not dangerous, in fact the building is very strong and well built, the walls are over a foot deep. It will be a shame to see it go. I phoned the secretary of the owner of the Old College Bar Colin Beattie the other day, the reason for this phone call was to see if I could get access to the closed Old College Bar. I was stunned to say the least to learn that the Old College Bar was still open. A well-known Glasgow Newspaper reported that the Old College Bar was closed for good and will not open again after the owners who least the pub got into financial difficulty owing a lot of money to Sky for not paying for the rights to view Sky programs. 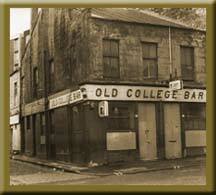 However Colin Beattie reopened the Old College Bar with a new manager. For all you drinkers and historians out there, please take this opportunity to visit the Old College Bar before it is completely demolished. Please Please support your local. We all know that the Old College Bar is the oldest pub in Glasgow, but did you know there is an old pre Victorian Street in the cellar of this old establishment? This antique pub was built in 1810 and had its first licence in 1812. When John Gorevan started his search for Glasgow's oldest pub, he was talking to the manager of the Old College Bar. John took some photos of the interior and exterior and was invited to have a look downstairs. The trap door behind the bar, leading to the cellar adds to the fantastic aged feel to the pub. When you come down the wooden steps, you are transported into a time before the Victorian Era. There is a cobbled street starting at the rear wall, curving around the cellar heading towards the St Mungo's Cathedral. You must watch your step as you might trip over the kerb while you imagine what it would have been like to walk along this street in the Napoleonic Era. Unfortunately back then, the camera equipment available was very poor. The poor lighting in the cellar meant that we couldn't get any proper photographs of the street. The Old College Bar is now soon to be demolished! I couldn't live with myself if we weren't able to document this hidden gem for everyone else to see. We were given permission to access the cellar again this year to document this wonderful street only to be quite disappointed. We also tried to figure out where the room would have been for the Professor’s and Student’s for their private parties when the old Glasgow College was thriving across the Street. The street had been given a DIY cement job to make it easier to walk on for the staff as this is where they kept their supplies. HOWEVER there was still some of the cobbles from the street visible from the surface of the cement that we documented. The kerb was also slightly visible with a very noticeable curve up to the Cathedral. Writen by John Gorevan jun. I would like to thank the manager of the Old College Bar and would recommend popping in before it's too late! Cobbles from an old Street, most of the cobbles have been cemented over since the first time I visited the cellar over 24 years ago. 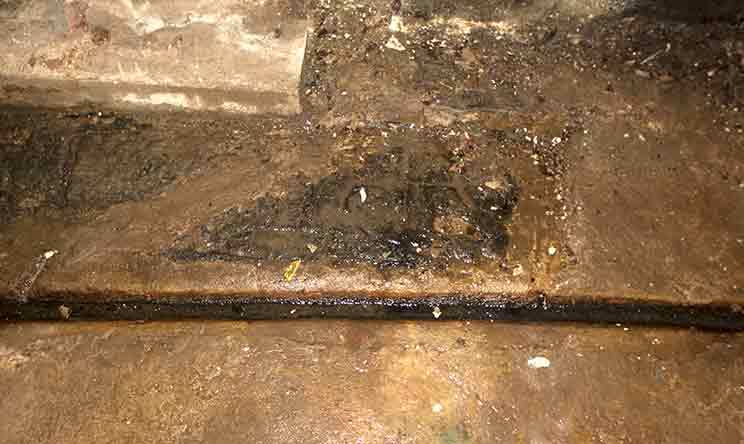 Another image of the cellar floor.